"The cause of brown skin spots is when the upper layer of the skin (epidermis) has a basal layer, which contains pigment cells containing melanin that gives color to the skin. Brown spots are often harmless discolorations or hyperpigmentation that can appear on different parts of the body but more commonly in areas exposed to the sun. See below for types and pictures. Most cases are due to Lentigines (Age or Liver Spots) or Seborrheic Keratoses). See a Doctor for a definitive diagnosis and for an annual mole check to make sure that any spots are not a melanoma (cancerous). Watch for signs such as the assymetry (not round), irregular edges, uneven colors and size (larger than a pencil eraser.) 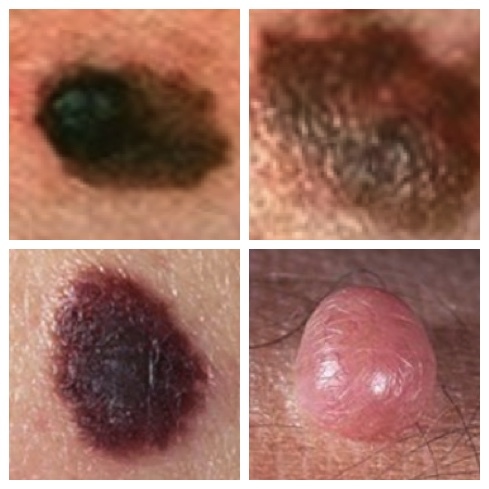 If the mole, nevi or brown spot has remained the same for the last year, is symmetrical, has distinct borders, is similar to other spots or moles and is primarily one color, it is probably benign (not cancerous)." Melanocytes or pigment cells are irregularly distributed throughout the skin. Exposure to the sun’s ultraviolet (UV) rays accelerates the production of brown pigment or melanin, which creates a tan that helps protect the skin from harmful UV rays. Some areas of the skin, however, are more likely to be subject to prolonged sun exposure, causing the pigment cells to produce more melanin, resulting in brown skin spots. Many pigment cells may be clumped and they may appear to produce pigments in high concentration, leading to the appearance of brown spots. Other factors that can increase the appearance of brown spots on skin include aging, exposure to commercial tanning beds and tanning lamps. Genetic predisposition likewise plays a role in the appearance of brown skin spots. Darkening of the skin resulting from post-inflammatory hyper pigmentation occurs after an area of the skin heals from an injury or recovers from a skin disorder. Age spots are brown, gray or black skin spots that form in areas that have been exposed to the sun, tanning or a tanning bed. They can be the size of a freckle or up to 1/2" in diameter. Brown spot from a tanning bed form by increasing the melanin in the skin. This is similar to the way UV rays from the sun cause an increase in melanin production. Like all brown skin spots, if they change in appearance see a Dermatologist. Sun spots (solar keratosis) usually refer to a condition called Actinic Keratosis. They are similar in appearance to age spots. Actinic Keratosis are brown spots from tanning beds or excessive UV sun exposure. Actinic keratosis is considered pre-cancerous and could eventually develop into a melanoma. For this reason, people with "AK" should see a Doctor for frequent mole checks. Skin tags are called fibroepithelial polyps and squamous papilloma. They are oval in appearance and are either immobile or attached via a narrow or broad stalk (pedunculated.) The color is flesh to brown in appearance. They are more common in obese individuals and are seen in groups of 3 or less. They start to appear after age 20 and stop growing after age 60. Locations are usually in the armpits (48%), neck (35%) and groin. Skin tags are not contagious and are benign (not cancerous). These tags can be treated by snipping them off with scissors or via electrocautery. Dark patches on skin caused by Seborrheic Keratosis. Note the characteristic horn cysts that can be white or deeper seated, black or superficial. Seborrheic keratosis is the most common benign skin tumor (neoplasm). They appear more frequently as a person ages and are ..2 to 3.0 cm in size. Spots have a greasy feel to them. The surface is either smooth or cracked and rough. They almost appear as if they are "stuck" to the skin and can be of varying height. Brown skin spots start out as flat and small, and feel slightly scaly when touched. As you age they can become raised. They also easily scrape off the skin. Color is black, tan or brown and have uniform surface appearance. They can become inflamed in specific locations, increasing the chance that it would become confused with a melanoma. They tend to appear in sun exposed area so it would be common to see them on someones back, but not on the buttocks. Diagnosis is done by taking a skin sample (biopsy). They tend to appear on the trunk, but can be found on the arms and head. 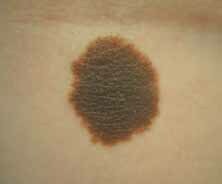 Seborrheic keratosis is sometimes mistaken for a melanoma (cancerous mole). They also appear to have white or black horn cysts embedded in the lesion surface. Treatment is via currettage (surgical scraping of the skin) or cryosurgery (freezing). 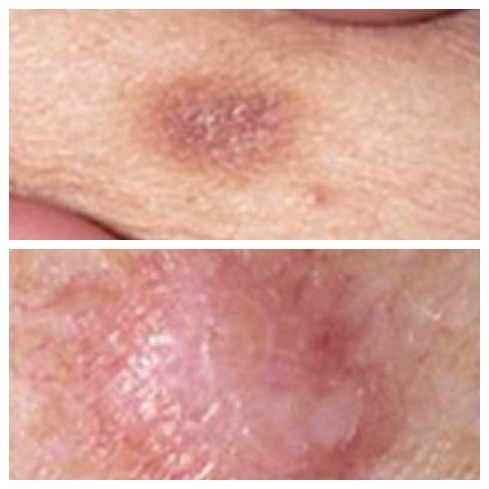 Examples of Seborrheic Keratosis light brown spots on skin that formed near the hairline and under the breasts. When under the breasts they can become thinner. The brown spot on the face is a benign congenital nevus. There are several types of Nevi (general, junctional, dermal, compound, acquired). Nevi or moles are first seen from birth to age 20. Nevi that appear after age 50 should always be evaluated. The Nevi will change in appearance the older a person gets and can grow in proportion to the boy. They can also naturally become darker as the skin is in the sun, from the use of birth control pills or when you are pregnant. Nevi tend to appear people with lighter skin with the exception of nail beds and eye areas, which are seen in darker skin people. Junctional Nevi in particular have a uniform brown color. Dermal Nevi are light brown and elevated in a dome shape. Each person tends to have Nevi in one similar pattern. If one Nevi looks out of place in shape or color, it should be investigated. Melanoma tends to have a pattern which is different than other Nevi on the body. See below for examples. The appearance of Nevi changes based on your age. 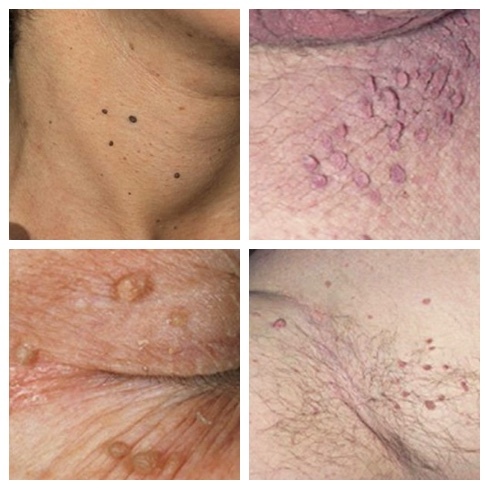 Some Melancytic Nevi passes through multiple phases on the skin, starting as a skin spot surrounded by a white halo, and then progressing to a more scarlike appearance as seen above. People with Atypical Nevi that look like a fried egg like this one should be evaluated annually for Melanoma. Medium congenital benign nevus on back of leg. Brown spots on back called acquired melanocytic nevi. They appear in early childhood. If new moles appear after age 50 they should be evaluated by a Dermatologist. Most appear in skin areas that are exposed to the sun. Dermatosa papulosa nigra causes multiple brown to black papules. They cause brown spot on African American skin. It is believed to be related to seborrheic keratosis. They appear on young to middle-aged African Americans. Dermatosa Papulosa Nigra can cause light spots on African American skin that looks like brown to black dome-shaped papules. 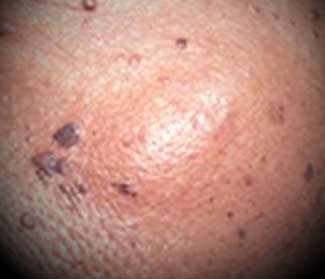 Keratoacanthoma light brown skin spots can have a keratin plug (right) or appear as a dome shaped nodule or papule. Kerotoacanthoma is a common type of benign tumor. It is commonly seen in 64 year olds during the summer months. 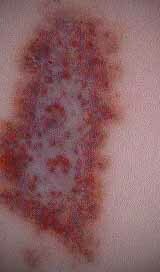 It is usually appears on the trunk of the body (areas that are sun exposed.) It can also appear at the site of an injury. The tumor grown to 1-2 cm and then stops growing and changing. It may be confused with molluscum contagiosum and squamous cell carcinoma. Tumors eventually shrink and disappear over a 2 to 12 month period, leaving behind a scar. Treatment options for KA to avoide scarring are available including topical creams (Efudex, Carac), intralesional injection, monthly treatments with intralesional methotrexate or the medication Aldara cream (imiquimod). Dermatofibroma are benign lesions that are commonly found on the outside of the legs. They are a skin reaction to a viral infection, injury or insect bite. The lesions can be painful, itchy or have no symptoms. In some cases they are hard to the touch and scaly. A dermatologist will give them the "dimpling test" which means they will retract beneath the skin surface when compressed with the fingers. 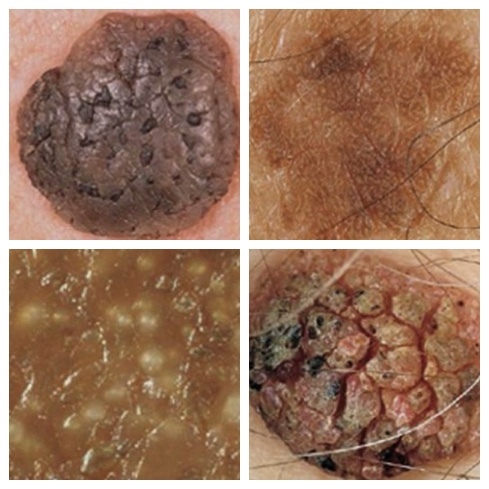 Solar keratosis is a squamous cell carcinoma referred to as a pre-cancerous lesion. It occurs after years of sun exposure. The number of skin lesions grow with age and may have visible veins or a reddish appearance. Lesions will bleed if scratched and have a rough texture. When on the face, skin that surrounds the lesion may have some discoloration and dilated vessels. This condition can progress to squamous cell carcinoma. Cryosurgery is the preferred treatment. The topical 5-FU is also used. Solitary neurofibroma are benign tumors. They are raised above the skin and have a roundish shape. It is 2mm to 20mm in diameter and is soft to the touch. Solitary neurofibroma brown skin spot. Basal cell carcinoma is the most common type of skin cancer. Lesions frequently bleed or scab. They occur at all ages, but are more prevalent after age 40. Basal cell spots are destructive and aggressive and can occur in areas that have not been exposed to the sun. 85% are found on the neck and head, with 25% to 30% on the nose. 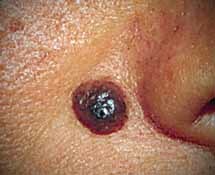 Basal Cell Carcinoma can cause a lesion with crusts and scaling which looks like a brown spot in the middle of the mole. Look for either pearly white borders or elevated borders. Use the ABCD mole guide to determine if a brown skin spot is a malignant melanoma (Nevi). If a mole becomes suddenly darker (black or brown), see a dermatologist immediately for a mole check. The diagnosis for brown spots is easily made by a physician upon taking a medical history and a physical examination. Laboratory tests such as blood tests or skin biopsy may be done if the brown spots are irregularly shaped or multi-colored, to rule out suspicious lesions like cancer. 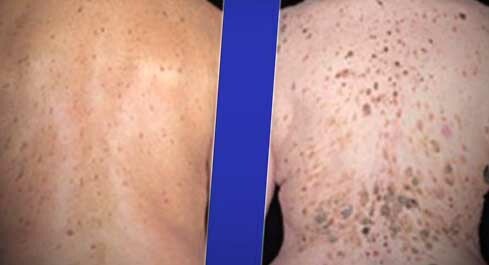 Brown spots due to aging are often seen in fair-skinned individuals, but they can also appear in people with dark skin. These brown spots may appear as freckles but they may become bigger or group together, making the brown spots appear bigger in size. There are no significant symptoms such as pain, itching, or discomfort associated with age spots. These spots commonly appear after the age of 40 (or earlier) in exposed body parts such as the face, forehead, back of the hands, forearms, and shoulders. Post-inflammatory changes in skin color causes brown spots to appear after a traumatic injury such as acne, which leaves a light to dark brown discoloration on the face or the trunk. Skin changes due to burns, cuts, scrapes, orinsect bitesoften affect the arms and legs. Dark patches associated with pregnancy,other hormonal changes or drug intake may disappear after the delivery of the baby or after drugs are discontinued. No other symptoms are experienced. Most brown skin spots are harmless but if the dark spot is irregular in shape, size, and color, rapidly changing and accompanied by bleeding, one must consider skin cancer such as melanoma. Brown skin spots that arise from prolonged exposure to the sun, hormonal changes, or post-inflammatory changes do not need treatment especially if they are not accompanied by other symptoms. However, many people seek treatment for cosmetic reasons to improve their appearance such as the use of Olay Correcting Spot Treatment. In cases of skin cancer, the underlying disease must be treated to protect the individual’s health. Brown skin spots caused by excessive sun exposure, aging,or post-inflammatory hyperpigmentation may be treated using over-the-counter creams and lotions to lighten the spots. Cosmetic products may also be used to hide them, including skin-bleaching products that may contain tretinoin, hydroquinone, or kojic acid. Prescription strength skin lightening products that contain retinoic acid (a vitamin A derivative) and steroids may also be recommended by dermatologists. Exfoliating products, which contain glycolic acid, papaya extract, or salicylic acid, are also available as OTC treatments. Skin brightening compounds and bleaching lotions withhydroquinone, licorice extract, and bearberry also work with fruit acids to lighten dark spots, including the product NIA 24. Other treatment methods to reduce brown spots and improve skin appearance include phototherapy, microdermabrasion, chemical peeling, and laser treatment. Dr Katz and Dr. Rivlin Dermatologists in South Beach describes the causes and treatments for brown skin spots. How to treat skin that has brown spots. by: Dr. Neil Fenske, M.D. Mayo Clinic. Age spots (liver spots).